Little if any sign of use. I need your zip code to calculate the postage. 3 plates as well teapot available. This is part of the Sir Francis Drake line. 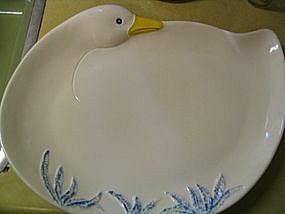 I have never seen one of these platters with blue grass. Measures approximately 16 inches x 12 inches. There is no structural damage, however, there are many manufacturing flaws, including several dark fired in spots. Need zip for postage calculation. The underplate is attached. No chips, cracks or breaks. Does not appear to have any utensil marks. 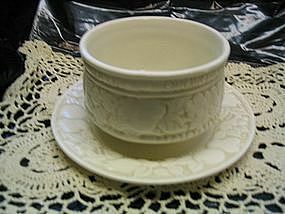 Other pieces of this pattern are available and priced individually. I need your zip code to calculate the postage. 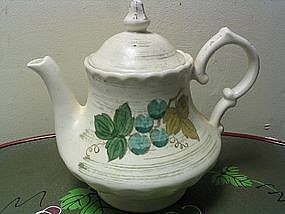 Teapot in the San Fernando style. It holds a bit over 40 ounces and is approximately 7 1/2 inches in height with the lid in place. No chips, cracks, breaks, rough rims or wear to the finish. 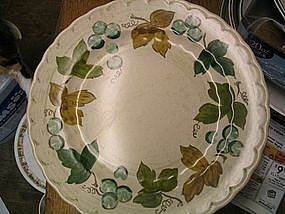 I have the covered casserole in this pattern available for purchase, as well as several dinner plates. I need your zip code to calculate the postage.